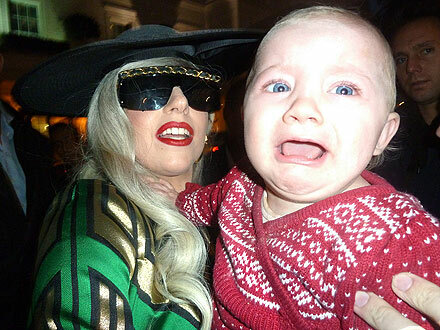 Lady Gaga reportedly wants to have a baby within the next year. The 25-year-old 'Born This Way' singer has apparently decided to start a family with boyfriend and 'Vampire Diaries' actor Taylor Kinney. A source said: "She's already doodling baby names on scraps of paper. She's been bragging about how beautiful their children will be because Taylor is so handsome. "You know this is the real deal because she never talked about babies when she was with her long-term ex-boyfriend Lüc Carl. With Taylor, that's all she talks about now." And 30-year-old Taylor - who met Gaga last summer whilst playing the love interest in her 'You and I' video - is said to be 'starry-eyed' about becoming a father. A second insider told the Daily Star: "He's walking on air right now and can't stop talking about how he's going to become a dad and settle down. "If you have the sort of money they do - especially Gaga - there really isn't a problem about having a baby out of wedlock these days. "They'll get the chance to see how they adapt to parenthood and - heaven forbid - if things go wrong, there won't be any ugly divorce and there will never be a problem about supporting the kid." Meanwhile, the happy couple is said to have just returned from a trip to Taylor's hometown of Lancaster, Pennsylvania, where they broke the news to his family. His aunt Kathryn Loh said: "There's no doubt he loves her and she loves him. Now everyone's met her, we love her too! They are perfect together. "I'm so glad we got to meet the woman behind all the make-up and the outfits. She's very well spoken and down-to-earth. She's basic - a sweet, normal, healthy person."